These two short films could launch a variety of conversations. Which might you pursue? Does Modernism catch your interest? Or the medium of film to capture art? Connect a topic you enjoy to an assignment. Discuss the tangential topics with a librarian, academic advisor, or your instructors. Financial databases are the bread and butter of business research. They are crucial in helping you find company financials. You can make proper comparisons between companies. This month, we want to introduce a financial database which you can access remotely, from the comfort of your home or cafe: Standard & Poor’s NetAdvantage. NYU Shanghai Library’s collection and services will be closed from Feb. 15 to Feb. 21. Electronic resources are available 24/7. For research assistance in the meantime, please email librarians in NYC at https://library.nyu.edu/ask/email/, or use the chat widget on the library website. This movie makes me think about so many topics all at once. There are the obvious categories of finance, markets, and regulation. Then there are the issues of privilege and access, both to information and to money. Or questions of personality and communication: who is working hard, quietly or alone, to explore the facts while others are loudly selling catchy phrases in ignorance? I hope you are inspired to follow one of these lines of inquiry by watching a video or reading a book below. If another idea sparks your interest, the library can help you locate diverse opinions for supporting your exploration. What does the Big Short make you think about? Are you already reading New York Times? Do you want to start a news reading habit? Our Library subscribes to New York Times, and now you can read on NYTimes.com with a personalized account. This gives you complimentary access to NYTimes.com and NYT apps. Visit AccessNYT.com while connected to our campus network. Enter ‘NYU Shanghai‘ under school name. 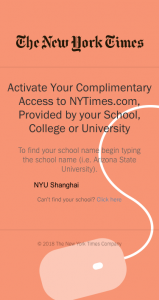 Create an NYTimes.com account using your NYU email address. If you already have a NYTimes.com account, you can link to it. After registration, you can enjoy access to NYTimes.com from anywhere. You can also download the NYT mobile app. Take note that this NYTimes.com Pass will be valid for a year. Are you an instructor? For exclusive educational content and resources, create an account at NYTimes.com/edu. In the following weeks, we will continue to release a series of posts to introduce resources on statistical computing, data visualization and to help you catch up with the ever-changing industry trends. We therefore present to you the Data Resources Mini Series – Not Just Buzzwords. # Always read the R official documents first. # Stack Overflow and Google are your friends. # Do a project. Choose a complex one. # Be a teacher. Explain something to someone else. # Learn something even harder than you actually need but in related areas. Then return to your problems. Wait, did I say “come to the Library workshops” in the secret recipes? If you did not make to the R workshops, here are the workshop notes. Alright. Let’s take a look at some tutorials and blogs for learning R with general purposes. We have something for everyone from absolute beginners to more experienced users. Next time we will share books and blogs on data visualization. Stay tuned! Cheat Sheets of using R for various purposes from the Base R all the way to deep learning with R.
A quick access to R, especially if you are from Stata, SAS, SPSS etc. R programming + data analysis + research workflow. Some people find the JHU courses too R heavy. This specialization focuses on teaching statistics while people learn to use R through projects. R news and tutorials for numerous topics. R graphs and codes by chart types. Previously had a focus on visualization with ggplot2 but not limited to that. We are dedicated to helping faculty utilize instructional and research tools and technologies for teaching and research. We develop Technology Enhanced Education (TEE) initiatives that assist the community in exploring innovative ways to impact teaching and learning with instructional technology. Adrian manages the RITS team towards the development of a range of educational technology and data projects at NYU Shanghai. He has an information management background in government, health and education sectors in the UK and Asia. Adrian works in close consultation with faculty to understand pedagogy needs in the use of instructional technologies as well as the development of a range of TEE (Technology Enhanced Education) experiments and initiatives in fully online and blended learning courses, working closely with instructional technologists at NYU Shanghai and across the NYU’s global locations. 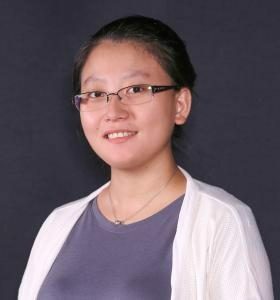 Yun joined the team as a data services consultant following her Technology Enhancement Education Fellowship with the Library. She supports statistical computing and visualization tools through workshops, in-class instructions, consultations and online guides for faculty, students and research staff. 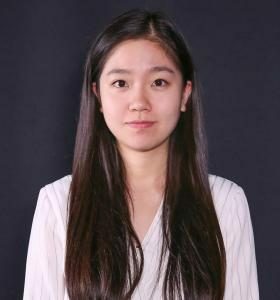 Yun has developed a range of data resources, and cooperates with other parties on research projects utilizing her data skills. 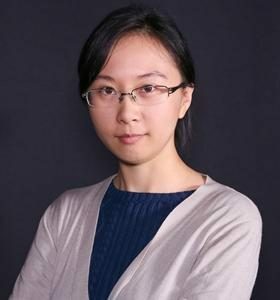 She built up and co-manages the Chinese Datasets Archive with the Center for Data Science and Analytics. Yun holds her Bachelor’s degree from Peking University and her Master’s from Columbia University (GSAS). 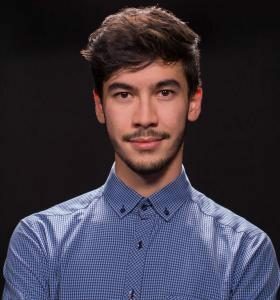 Noel is a Technology Enhanced Education Fellow at NYU Shanghai who explores applications of machine learning, VR, and AR in an instructional setting. Noel joined the Research and Instructional Technology team after graduating from the inaugural class of 2017 at NYU Shanghai. His passion lies in artificial intelligence and machine learning. His workshops are centered around the skills that are most in demand in data science. Aside from being a data freak, Noel also loves Chinese tea and is passionate about learning languages. Fan is a Faculty Technology Specialist at NYU Shanghai. She holds a Master degree in Information Science and has worked as consultant, designer, and project manager on educational projects. Fan joined NYU Shanghai in fall 2016 and works closely with faculty to facilitate teaching through the application of various instructional technologies including GIS, data visualization, LMS, blended and online learning etc. She develops and delivers workshops based upon the request of faculty. Together with the Research and Instructional Technology (RITS) team and specialists over the global communities of NYU, Fan collaborates with colleagues to provide technical support and pedagogical consultation for faculty. Angela is a Teaching and Learning Technology Supervisor at NYU Shanghai who works closely with faculty and students as well as instructional technologists in Shanghai and New York. She consults with faculty to support daily operation of academic tools such as NYU Classes, NYU Stream, E-Textbooks and other systems in their teaching and research. She also facilitates workshops on NYU academic tools and other technology skills such as Microsoft Office for faculty, students, and staff at NYU Shanghai. Angela holds bachelor degrees in both Computer Science and English from East China Normal University. Mia is a consultant and designer who works closely with faculty in conceptualization, development, and redesign of courses that are both offered in classroom settings and online formats. She holds her Double Masters in Global Media and Communications from LSE and USC, and leverages her skills to help faculty and students incorporate multimedia, among other digital tools, in their teaching, research and learning. She also facilitates workshops on video production, animation, and digital expressions for faculty, students, and staff at NYU Shanghai. In addition to consulting and training, she provides support for the pedagogical use of NYU Classes. When the film ends, the discussion begins. Ready to connect an idea inspired tonight to an assignment this semester? The books below may be a doorway to interdisciplinary research or a minor to explore. This film draws on many ideas, from borders to brainwashing, from identity to espionage. History, literature, and sovereignty are additional options. Which part of the film speaks most to you? Or does part of the film connect with another class topic? Let’s start a conversation in the comments. Looking for practical tutorials on statistical computing and data visualization? Curious about the ever-changing industry trends? Don’t know where to start? Then you’ve found the right place. In the coming weeks, we will launch a series of posts to introduce data resources to you.This series is meant to be absolutely down-to-earth, reasonably dry, and most importantly not fancy at all. But it is also going to be extremely informative and highly useful. We therefore present to you the Data Resources Mini Series – Not Just Buzzwords. Before we start, make sure you’ve checked out NYU Shanghai’s all-inclusive guide on using Stata! If you missed our Library’s Stata Workshop, this site is the ideal place for you to access workshop notes, slides, and codes for all past sessions: Having done that, now we have many more useful resources to recommend to beginners and those who use Stata more substantially. The full web version of the list can be found here. A quickstart guide before you move on. Emphasizes data management and graphics. A thorough introduction from the basics to data management and estimation in Stata. Solutions to numerous real-life scenarios. A directory of practical guides for users with various experiences with Stata. The UCLA statistical consulting pages do not need recommendation. Use it as a dictionary of producing graphs with Stata. Each chapter discusses a plot type; each item is a line of commands, a graph and a description of how to and why. Keep the workflow in mind.